Bella Bethesda Salon, in Bethesda Maryland, was established in 2007. Their website was in need of an update, and we were contracted to refresh Bella's online presence. The old site was cramped (a typical condition of outdated websites), and their content was spread across too many pages, forcing users to click way too much. Additionally, updating their content was problematic and cumbersome; Bella's staff was active on social media, including Facebook, Instagram, and even a blog page, but all of it was spread across all the various platforms. For the new site, Bella wanted big photos, easy navigation, and a clean design. They wanted the contact forms (including the very detailed Bridal Consulation Form) to be re-designed and made more efficient. They wanted to be able to update content easily, as well as create blog entries, and perhaps show off their Instagram content. Since their priority was large imagery, we opted for a design that featured a slideshow of images right off the bat - the homepage now features full-screen photos highlighting Bella's work. 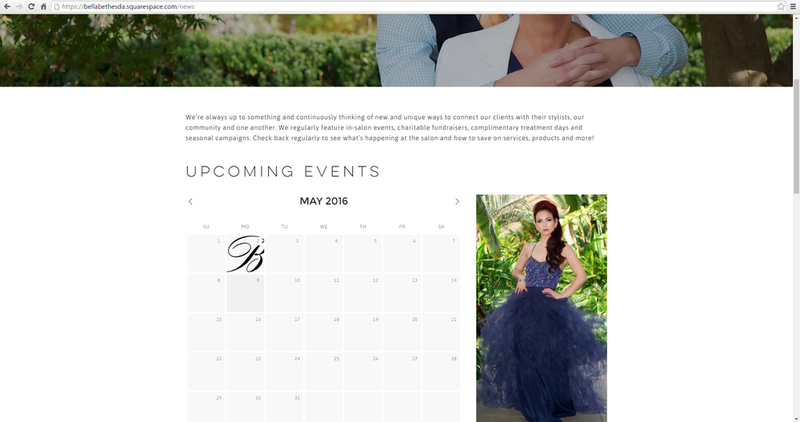 We included Facebook and Instagram feeds, so users can see new content as its added, right on the Bella homepage. We were also able to import all their existing blogs which were previously hosted on blogger.com - now they live on Bella's own site, and are completely searchable. Not only are they creating new blog entries now, they're also creating event pages, which then show up on a calendar in the News + Events page. We were even able to incorporate their custom typeface, which goes a long way when it comes to overall branding. 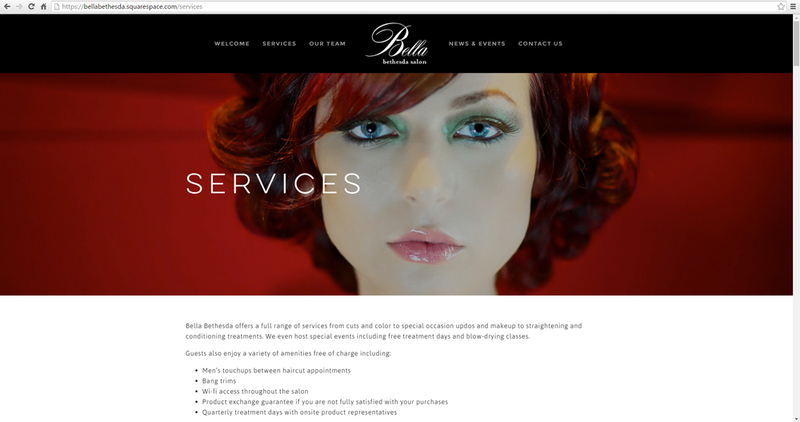 Bella Bethesda Salon's new site is contemporary, bold, dynamic, and mobile-friendly - a huge change from their previous look. Their new online presence communicates fresh, bold ideas, and marks them as a serious competitor in the salon industry.